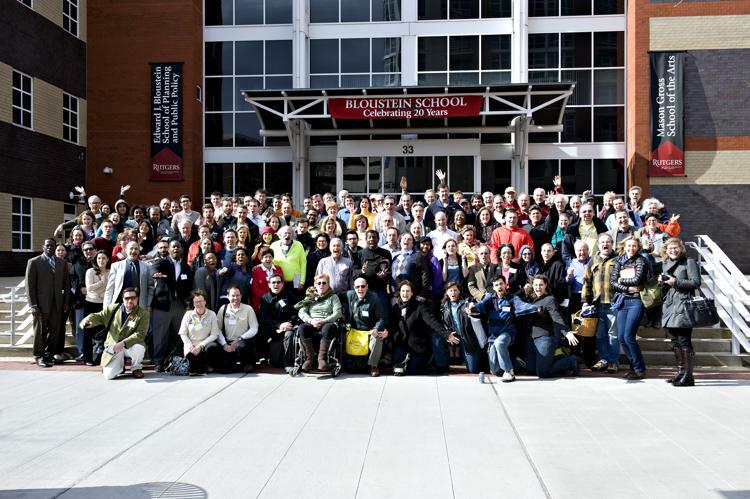 The 2012 BikeWalk Summit was held on Saturday, February 25, 2012, and was a great success. Over 150 attendees gathered in New Brunswick to hear over 30 presenters in 12 diverse sessions — all with interesting information to share. Jim Nicholson, Executive Director on NJBWC opened the day and introduced Jon Carnegie, Executive Director of VTC. Mr. Carnegie welcomed the attendees to the Voorhees Transportation Center and then introduced Jim Cahill, Mayor of New Brunswick, who gave a warm welcome to the participants and spoke about the enhancements during his administration to make the city more bike- and walk-friendly. Following the morning introductions, John Pucher, Professor, Urban Planning and Policy Development Program and Research Associate, Alan M. Voorhees Transportation Center, took the stage to introduce our morning keynote speaker, Jeff Miller of The Alliance for Biking and Walking. Jeff then proceeded to energize the audience with his exposition of the 2012 Bicycling and Walking Benchmark data. Links to photographs and presentations are at the bottom of this page. In addition, the agenda for the day, list of attendees, both by name and by organization, and speaker biographies are available. Our generous sponsors are here. We are very grateful for their support. Our midday plenary, moderated by Charles Brown of the Voorhees Transportation Center (VTC), featured Jerry Fried, mayor of Montclair; Paul J Matacera, former mayor of North Brunswick and current Vice President of MBI-GluckShaw; and John Sowell, City Council President of Irvington and a member of the Major Taylor Bicycle Club of New Jersey. All discussed how advocates can work effectively with legislators and elected officials. Mr. Matacera, in particular, struck a responsive chord when asked what the best thing an advocate could do to develop a fruitful relationship with a legislator. He said, “Make friends!” Mayor Fried detailed some of the notable achievements in Montclair, and Mr. Sowell underscored that by emphasizing the importance of biking and walking in creating desirable communities. We thank the VTC and the student volunteers from the Bloustein School of Planning and Public Policy, without whom we would never have been able to stage this event as successfully as we did. The presentations during the day were varied and well-attended. Many organizations took our advice and sent several delegates to the Summit, enabling them to cover more of the concurrent sessions. A short recap of the day’s topics and their presenters. Session One-Option 1: Bicycle Friendly/Walk Friendly Communities (Jerry Foster, WWBPA; Susan Polikwa, City of Hoboken; Nicole Wynands, League of American Bicyclists) — West Windsor is New Jersey’s only Bicycle Friendly Community and Hoboken its only Walk Friendly Community. This session focused on both, how they achieved their designations, and provided information as to how other New Jersey Communities could follow. Session One-Option 2: Lessons Learned – Holding Large Bicycle Events (Jay Marowitz/Jim Hunt, Morris Area Freewheelers; Tom Garrett, South Jersey Wheelmen; Mike Kruimer, Central Jersey Bicycle Club) — Ride organizers from some of New Jersey’s largest bicycle clubs described their rides, their growth, and the lessons learned along the way. Great information for towns and causes considering holding a fund-raising bicycle event for the first time. Session One-Option 3: Bikes and Transit (Andrew Besold, LCI; Jim Vance, Hoboken SweetStreets; Mike Viscardi, NJ Transit; Mike Dannemiller, The RBA Group as moderator) — An especially timely, and volatile, topic. The presenters examined the compatibility of two of the most efficient means of transportation – bicycling and mass transit – and some recent examples where the two do not work together as effectively as they should. Session Two-Option 1: Complete Streets (Sheree Davis, NJDOT; Charles Brown, VTC; Ranjit Walia, Civic Eye Collaborative) — New Jersey is beginning to see Complete Streets laws and policies germinate at the local and county level. Leading the way is NJDOT, making great strides in integrating their Complete Streets policy into the way they deliver transportation projects. The panel showcased some successful projects and Ranjit Walia premiered Civic Eye Collaborative’s new Complete Streets video. Session Two-Option 2: Recycling Bicycles for Charitable Purposes (Russell White and Petra Strickland, The Bike Exchange) — With bicycle exchanges currently operating in Newark, Plainfield, and Trenton, with proceeds benefiting the Boys and Girls Clubs, the panel presented a successful business model for a bicycle recycling activity. Session Two-Option 3: Bike/Ped Data Collection (Dan Nemiroff, Delaware Valley Regional Planning Commission) — Bicycling and pedestrian infrastructure projects depend heavily on data collection both to win approval/funding and to measure effectiveness. This session provided guidance on how organizations can effectively collect and use such data in their own planning. Session Three-Option 1: The League of American Bicyclists Education Program (Alissa Simcox, LAB Education Director) — Bicycle education is a main platform for NJBWC as we believe bicyclists who are knowledgeable and confident riding on our roads can overcome virtually any lack of bicycling infrastructure. After all, what do you do when the bike path doesn’t go where you want to go? You ride your bike like you drive your car. Alissa Simcox outlined the current League education program and gave some insight on proposed changes. Session Three-Option 2: Mountain Bikers and Advocacy (Frank Harms, President, Jersey Off-Road Bicycling Association/JORBA) — Mountain bikers have been strong cycling advocates for many years, not only with words but with their actions. Frank described some of these actions, including trail building in some of New Jersey’s many parks. Session Three-Option 3: A Tale of Two Bikeways: Community-Centric Bicycle Planning (Jonathan Hawkins, Aimee Jefferson, Dorothy Le, David Nelson, Tiffany Pryce, Sofia Recalde; students at the Bloustein School of Planning and Public Policy – introduced by Professor John Pucher) — An examination of a 2.2-mile system of dedicated infrastructure in the New Brunswick area between Bucceleuch Park and the Cook-Douglas Campus. Considers both the needs of the predominant Rutgers student population along College Avenue as well as the predominantly Hispanic neighborhood along Suydam Street, it provided attendees with a basic understanding of background research and preliminary design necessary to implement similar projects in their own community. Session Four-Option 1: The Three-Foot Law – A National Analysis (Charles Brown, VTC; Patrick Farley, Jonathan Hawkins, and Christine Orthmeyer, Bloustein School of Planning and Public Policy) — Presented in a courtroom-styled debate, the session examined the current state of knowledge regarding the three-foot law. Also highlighted were the law’s perceived strengths, weaknesses, and overall effectiveness in protecting bicyclists. Session Four-Option 2: NJBWC: Building a Strong Bike/Ped Advocacy Organization (Peter Kremer, Parsons Brinckerhoff; Mike Dannemiller, The RBA Group) — Bicycle advocates from around the state, in a moderated session, discussed the role of a strong statewide bike/ped advocacy organization. Mike Kruimer, President of the Central Jersey Bicycle Club, presented both NJBWC and the League of American Bicyclists generous donations in memory of Tom Koenig, a CJBC member who passed away in 2010. David Brinkley, President, September 11th National Memorial Trail, described efforts to build a triangular bike trail from the World Trade Center site, to the Pentagon, to Shanksville, PA, and back to New York City. David traveled up from Virginia just to make his presentation. John Sowell, a member of the Major Taylor Cycling Club of New Jersey, described his recent cross-country bicycle ride and revealed his plans to cross the country again, this time from north to south. Laura Torchio, of Bike Walk Montclair, entertained us all by snapping photos of attendees dressed as the Bike Lane Fairy. To see some of the shots, visit BWM here.